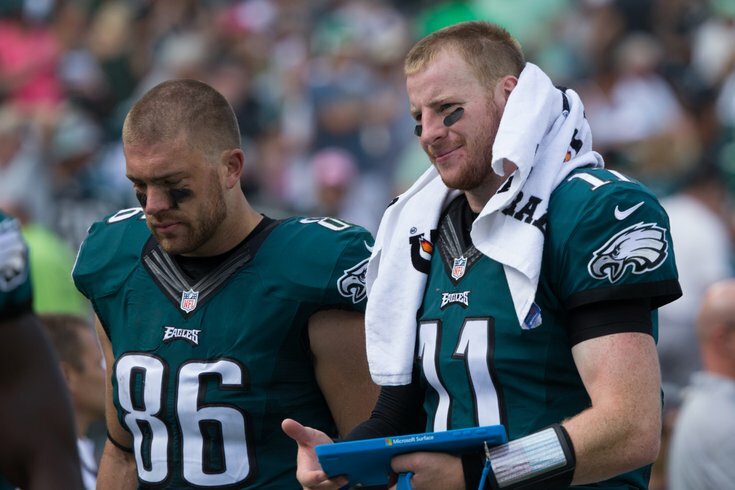 In Carson Wentz's return to action Sunday, a 20-16 victory over the Colts, it was clear that perhaps more than any other quarterback, Wentz loves throwing to his tight ends. With Alshon Jeffery still out and other injuries dogging the wide receiving depth, Wentz more or less made it irrelevant in Week 3, targeting his tight ends on 21 throws. This compared to seven throws meant for wideouts and nine meant for running backs. Rookie Dallas Goedert emerged as a big beneficiary of Wentz's decision making, netting seven catches and 73 yards. Zach Ertz also starred, collecting 73 yards on 10 targets, five of them catches. Wentz's second pass and first completion was vintage Carson, finding Ertz across the middle for 17 yards and a first down. To cap off a perfectly sculpted 12-play, 79 yard drive, Wentz hit Goedert for a wide open score (the first of his NFL career). Similarly built (both are 6-foot-5 and just around 250 pounds), it comes as little surprise that the Wentz to Goedert connection was also featured against the Colts. In addition to the two both hailing from smaller schools in the Dakotas, they also had some extra time together in training camp as Nick Foles took many first team reps leaving Wentz with the 2s and Goedert quite often. If fans needed more assurances that Wentz was back in full force — after months of rehab from ACL surgery — it came after Wentz took his first hit later in the first. The QB escaped three would-be tacklers in the back field before completing a pass over the middle to Goedert. He drew a roughing the passer penalty and was back on his feet immediately as the drive led to a 55-yard missed field goal. His decision-making did hit a snag when the second half began. as a forced throw toward Ertz over the middle was instead caught by linebacker Anthony Walker for an interception that set up Indy deep in Philadelphia territory and an eventual field goal (and 13-10 lead). Wentz also fumbled in roughly the same spot on the field as the third quarter wound down — a rare second turnover as he appeared to be leaving the pocket to scramble. This also led to an Adam Vinatieri field goal. A 29-yarder to Ertz put Wentz in the red zone where a dropped pass to, who else but Ertz, led to a tying Jake Elliott field goal. Wentz most impressive play came inside the five minute mark, when he somehow dodged a pair of tacklers, stepped up in the pocket and found Nelson Agholor for a huge first down with Philly trailing by three points. A few plays later Wendell Smallwood punched in a four-yard score to put the Birds back on top. With Wentz functioning more or less as a game manager, a fourth down goal line stand that ended on a fourth down sack by Derek Barnett won the game for Philadelphia. Wentz's return to the field saw him go 25-for-37 for 255 yards, leading the Eagles to 26 first downs (compared to just 13 for the Colts — with six coming in the last two drives). With his feet wet — literally, it rained most of the afternoon (a potentially rude awakening for a surgically repaired knee) — Wentz surely should look a bit better in Week 4 when the Eagles travel to Nashville to face the Titans.